Simon Speer (Nick Robinson) is your typical high school student. He's close with his loving family, and has a wonderful group of friends, but is also hiding that he's gay. Upon discovering an online confession from another closeted student at his school, going by the pseudonym of "Blue", Simon strikes up a regular conversation with him, which leads to him developing feelings for his mystery classmate. What some may see as unrealistic and sanitised, this reviewer sees as being treated in the same manner as straight romance tales that are often released. Director Greg Berlanti has a brilliant handle on this film, capturing the heartfelt moments so effortlessly, while managing to inject a great sense of humour that regularly hits the mark. Central to the film is the blossoming relationship over email, with the identity of Blue kept a secret, making for an engaging mystery within. The connection between the two feels utterly natural and well developed, and helping this work is a terrific lead performance, as Nick Robinson tremendously portrays the eponymous character. In spite of having pretty liberal parents and open friends, Simon is beset with fears about coming out. Be it the idea of things changing, or little comments from his father, the worries are well captured, and put to screen, by those involved. His friends, portrayed by Katherine Langford, Alexandra Shipp, and Jorge Lendeborg Jr, each get their own moments to ensure their characters are distinctive enough, well rounded, and downright likeable. As Simon's parents, both Josh Duhamel and Jennifer Garner stand out in this spectacular cast. While Duhamel gets numerous portions to show off his portrayal, Garner manages to sell her wonderful performance through one speech. It's a tender scene that's packed with emotion, in a moment akin to Michael Stuhlbarg in 2017's Call Me By Your Name, and is sure to leave some audience members teary eyed. As much as I could heap more adoration on the film, there is one notable problem, and it lies with Martin, played by Logan Miller. His existence relies on being a problematic plot device who has to be an obstacle for the characters, and never manages to feel like an actual character. As such, moments where we're asked to sympathise with him fall flat, while it's hard to care when he so easily resorts to blackmail from early on. 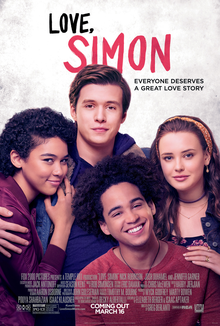 Love, Simon is a touching story of identity, friendship, and love, brought to screen in such a sweet manner. Here's hoping it opens the floodgates, and we see major studios releasing plenty more stories told from perspectives outside of straight protagonists.